• Qi Certified by Wireless Power Consortium (WPC) assures safe, reliable wireless charging and compatibility with Qi-enabled devices. • Protects your device with advanced safety features like built-in Foreign Object Detection. 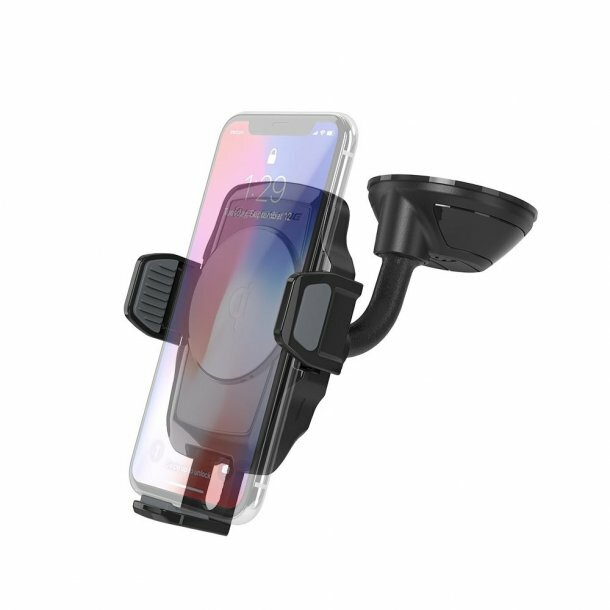 • Adjustable mount safely secures mobile devices up to 3.5 inches wide to the window/dash via StickGrip™ suction base. • 360˚ adjustable design permits unlimited viewing options. • Works with Qi-enabled wireless charging smartphones from Apple, Samsung and others and other Qi-enabled devices. • Includes USB power adapter and micro USB cable. The window/dash mount suctions to nearly any surface with the suction cup. The StickGrip suction cup creates a secure hold on windows and textured dashboards so you can mount your device wherever you want it. If the StickGrip ever loses it's grip, simply rinse the suction cup off with lukewarm water, shake and let air dry. Qi Wireless Charging Techology - Works with Qi-enabled devices. Qi Certified assures safe, reliable wireless charging and compatibility with Qi-enabled devices.